Explore our France surf holiday destinations. France was the first country in Europe to popularise surfing. Most notably in the Bay of Biscay in the the South West corner. in the mid 1950's a Californian director was shooting a film in Biarritz and noticed wave after wave of perfect unridden surf. He introduced the idea of getting on a board and riding them to a few locals and they were hooked! Michel Barland and a few friends started making boards and soon enough France's first surf club, "Waiikiki Surf Club", was born. Word got out quite quickly about France's surf potential and international surfers from the US & Australia began to travel to the South West of the country. Locals caught on quickly and surfing began to spread all the way north up the Atlantgic coastline to Brittany and the English Channel. In 1979 the country held the Lacanau Pro and in 1980 the World Amateurs. France was firmly on the map as one of the worlds top surfing locations. It is now the European capital of surfing with the surf town of Hossegor at it's centre. Many of the global surf brands have headquarters here and every September the WSL Quiksilver Pro is held on the world famous La Graviere beach break. What's the surf like in France? The area that begins at the Spanish border and reaches on up north along the French coastline has some of the best surf beaches in Europe if not the world. From the Bay of Biscay on up to the English channel the Atlantic Ocean sends wave after wave of surf. Expect a mix of everything: pumping beach breaks, mellow longboard rollers and epic point break barrels. The surf town of Biarritz offers a long summer surf scene that is unrivalled in Europe - every other week there is a different surf festival organised and the towns main surf beach La Côte des Basques is one of the best beginner/intermediate beaches that you will find and a great destination for learn to surf holidays. Biarritz is one of Europes most spectacular city's. It has some of the best restaurants and bars in France while also being surrounded by a great variety of beginner and world class surf breaks. The coastline south of Biarritz is full of beach breaks and some challenging reef breaks such as Guéthary. Every piece of coastline has a surfable wave! 2 kms out from Saint Jean de Luz coast is Belharra, France's big wave spot which produces monster waves every winter! The particular flow of the Ocean in the Bay of Biscay means the water is warm throughout the summer making the need for a wetsuit optional! From Biarritz down to the Spanish border, the region called Anglet, is a gold mine and what surfing holidays France are famed for. 25kms north of Biarritz is the surf town of Hossegor and its neighbour Capbreton & Seignosse. The area has become famous over the years for its world class beach breaks that can produce perfect 10 foot barrels that break very close to the shore. It is home top some of the best French surf camps. The waves here are household names among world surfers: La Graviere , La Nord, La Piste, Le Penon, Culd Nuls & Les Estagnots. Each September they play host to the worlds best surfers compete in the WSL Quiksilver Pro. Aside from the pros the area has a great range of beach breaks perfect for beginners surf lessons. Ask any surfer about Surfing France and Hossegor will be the first area they will think of. It has become a surf mecca and recently made it into 11 time World Champ Kelly Slater's top 5 surf destinations of all time. The 3 towns are full of cafés, bars and restaurants that spill out onto the street or the beaches. Most worldwide surf brands have a surf shop here so you may spend more than you had hoped! The Aquitaine region of France is basically the area south of the river Gironde. It runs south, almost in a straight line, for over 200kms and has the best beach break barrels in the world. Each town has its own uniqueness and a good selection if you are looking for a France surf camp or surf resort to stay in. Notable surf towns are Vieux Boucau, Moilets, Mimizan and Lacanau. The area is also famous for its massive white sand dunes, some as high as 100 feet. From June to September the waves are great for all levels, with very little flat days. Come Autumn and Winter the surf can be very challenging, the beaches are exposed to the full force of the Atlantic and the winds plus the sandbars are constantly shifting. The 700km stretch of coastline is quite varied with a mix of long open surf beach to reefs and coves. The area is more frequented by local surfers than travelers. Summer months, like the rest of Western France have great learn to surf conditions, while in winter the reefs tend to light up. Jutting out far into the Atlantic this area of France gets the more exposure to big Ocean swells than anywhere else. This can mean that the area doesn't have as much protection so local knowledge will help. The beautiful Northern Brittany cliffs can also make access difficult. Porza, Trestaou, Les Longchamps, Le Petit Minou are some of the more well known spots. Further South into Finistere the land gets flatter with large beaches and bays. Bigger cities have developed around Brittany and Brest when compared to the Aquitaine so the main spots can get busy but there are plenty of options. The area is home to the epic beach break La Torche,and the charging right reef break Lervily. The area round La Paule is great for beginners wanting to learn how to surf . The coastline faces north here so needs big West swell and windswells to get going. It is home to some of France's most spectacular coastline, with long beaches with white chalk cliff backdrops. Surfing waves like Etretat should be on everyone's list, a consistent left reef break surrounded by one of the worlds most incredible rock formations. 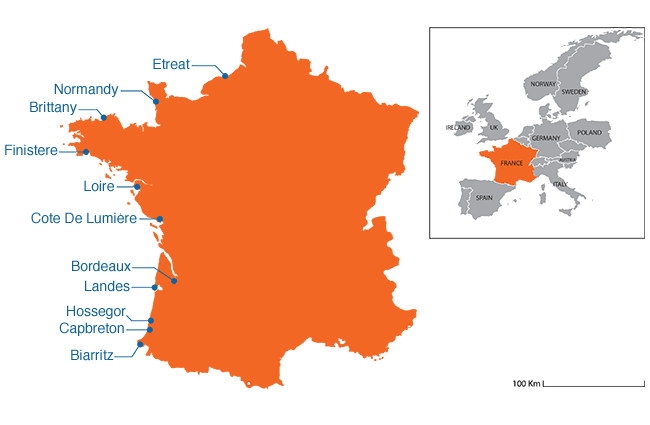 The area can get busy as it has major ports Le Havre, Cherbourg and Calais and is close to Paris. It is a beautiful region to explore and is rich in history from the D-Day landings in WW2 to the Viking raids centuries before. Waves of note include Cap Gris-Nez, Vacottes and the beginners surf around Hatainville. The Aquitaine & Côte de Lumière in South West & West France have glorious summers. Temperatures from June to September are around the 28ºC mark and rain never stays around long enough to upset a France surfing holiday! The water is also the warmest in Europe, reaching up to 22ºC degrees in August, thanks to the Bay of Biscay trapping in the heat from the sun. Winters in contrast can be stormy and wet. Temperatures average 12ºC degrees and colder at night. The good news is it doesn't last long as France has 4 good varied seasons. Water temperature will drop to 13ºC in January so you will need your boots! Water temperature in the Northern areas of Brittany & Normandy are a lot different, the water does not retain its heat so expect 15ºC in the summer and very cold 10ºC in winter. Air temperature will be a very nice 25ºC in summer, dropping to averages of 8ºC in Winter. For a more detailed look at when & where to surf in France for your surf level use our Surf Trip Finder. Then browse each destination to discover the best selection & lowest prices.